In Part I of this series, we examined some of the underlying forces driving the popularity of wood displays. These forces encompass both economics as well as evolving consumer tastes and preferences. In addition to laying the groundwork for the argument that wood displays are here to stay, we reviewed 3 examples of wood displays that we made in our domestic production facility in Southern California. 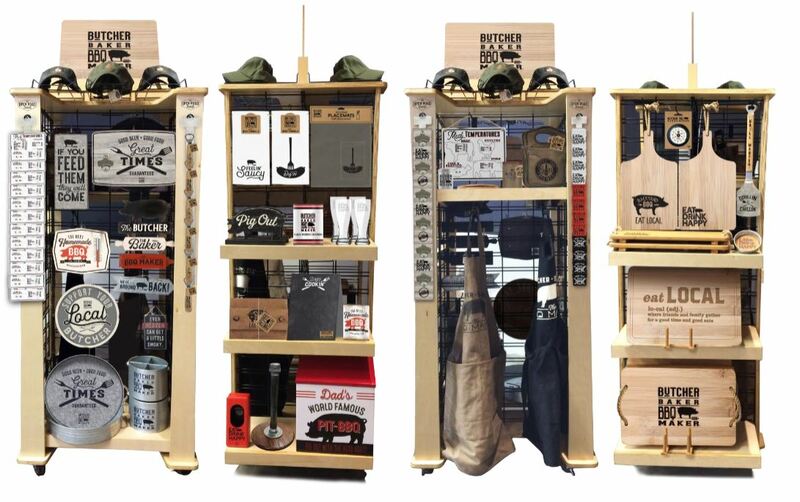 Our objective in today’s post is to share 7 additional examples of wood displays with the hope that it will inspire merchandising creativity for your next POP display project. Our first example is a locking eyewear case display for Vima’s line of training and sports performance eyewear. 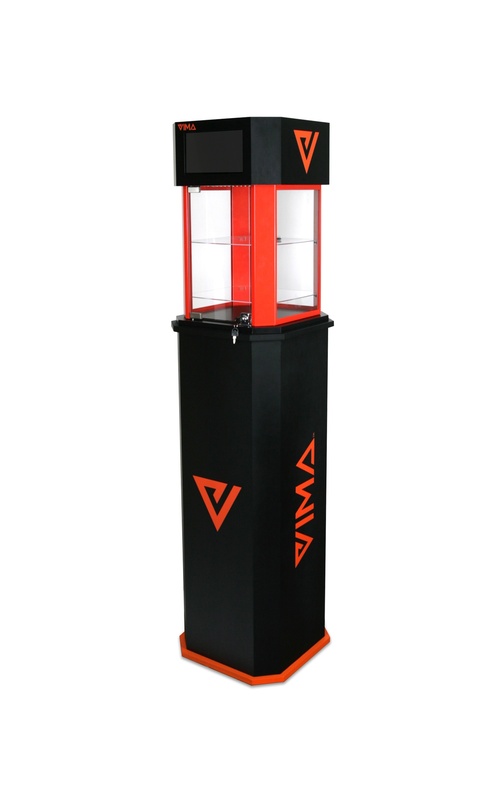 The display features an MDF locking podium cabinet with a separate mounted locking display case which includes a metal frame, glass panels and shelves, LED lighting, digital media player and vinyl graphics. 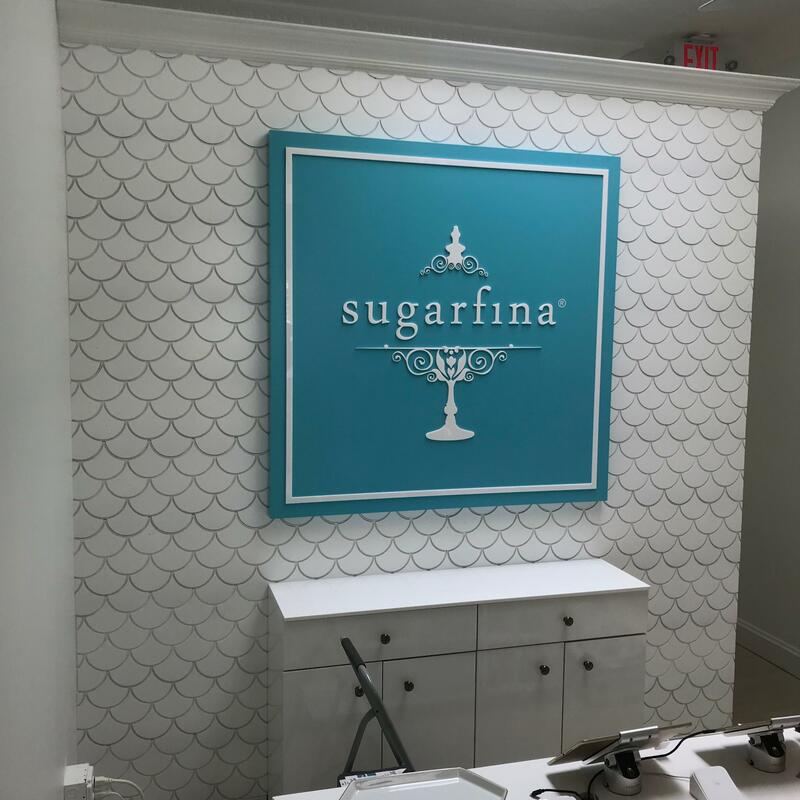 Our second example falls a bit more into the architectural store décor category, but we wanted to share it because the scalloped wall panel system we made for Sugarfina stores as shown below could also be applied to any kind of panel on a freestanding display, for example. The scalloped wall is constructed out of MDF with a routed CNC scallop pattern. After cutting, the wall pieces are painted glossy white and then clear coated. 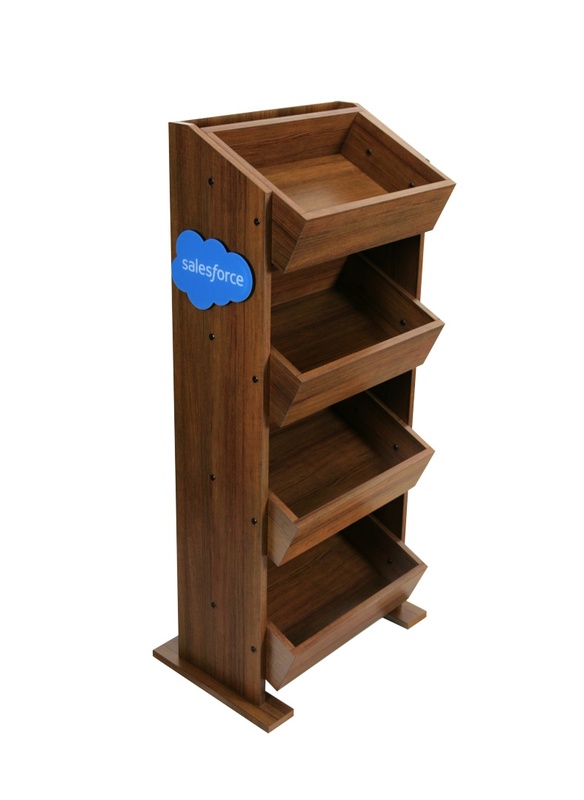 The next example shows a variation on one of our stock floor shelf displays. These types of displays all offer high utility, are knock-down with easy assemble, and a very economical. 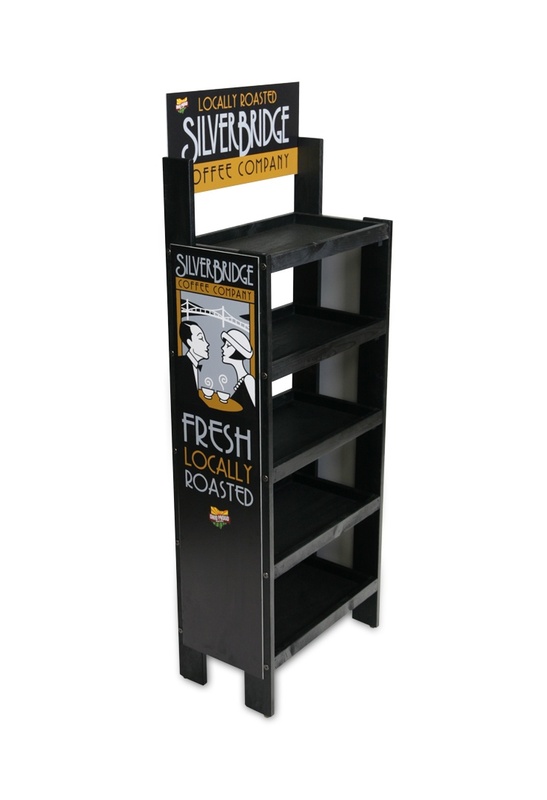 The first one shown below is one we made for Silverbridge Coffee. We painted the fixture black and added side and header digitally printed PVC signs to create a highly branded look. 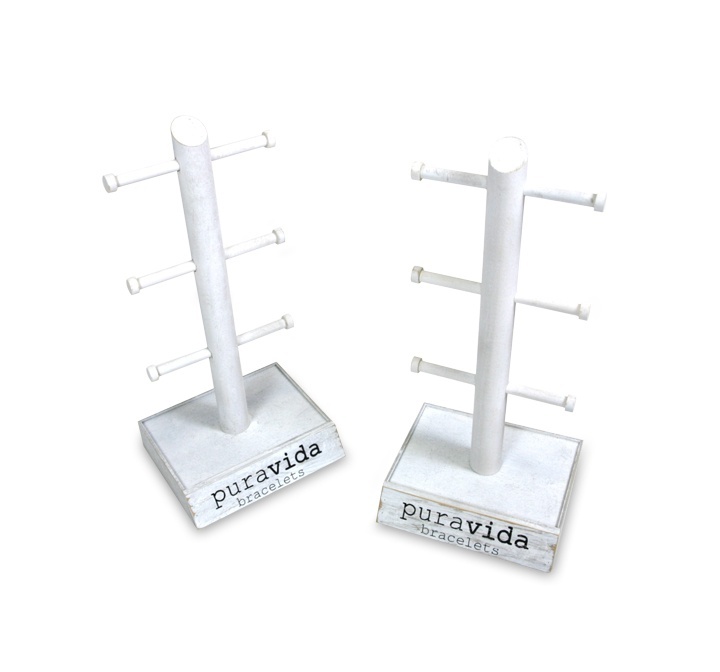 Fourth, we made the countertop bracelet display shown below for Pura Vida Bracelets. It’s a simple tree display with 6 arms, but it’s weathered white washed finish and screen-printed logo give this display a sense of authenticity which resonates with the brand and its Cost Rican product heritage. Our next example is a customized version of a 4-sided stock floor display that we made for Open Road Brands for an Ace Hardware rollout. The 4 merchandised sides are shown below. 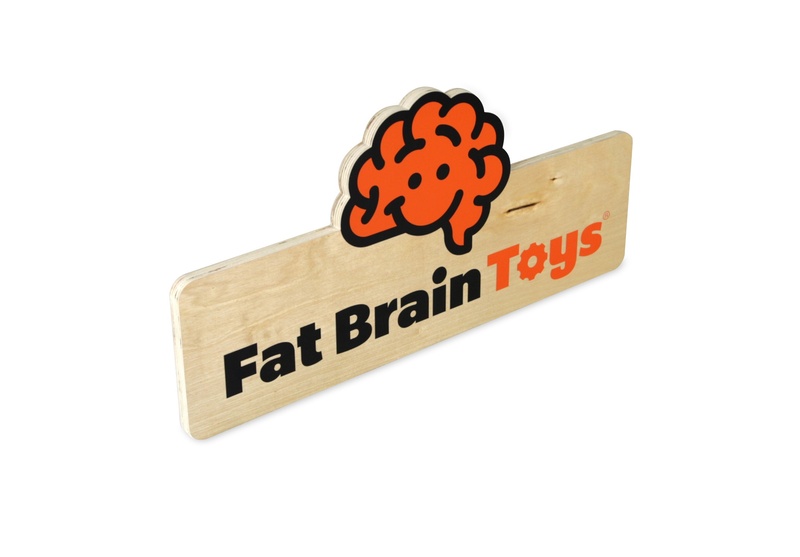 Like the Fat Brain Toys sign above, we used pre-finished birch plywood for the main structure and added black powder coated wire grids, metal hooks, wood shelves, clip strips, wire cap pockets, and a screen-printed bamboo header sign. This high-capacity display holds a lot of product, and we expect it to generate a high return on investment for our customer. Our final example today is a floor bin display we designed and manufactured for The Fruit Guys. This version was customized specifically for their customer Salesforce.com, and it currently sits in the new Salesforce Tower in San Francisco. This display includes a custom Teak laminate and side graphics that are constructed of laser-cut acrylic with a second-surface screen-printed logo.